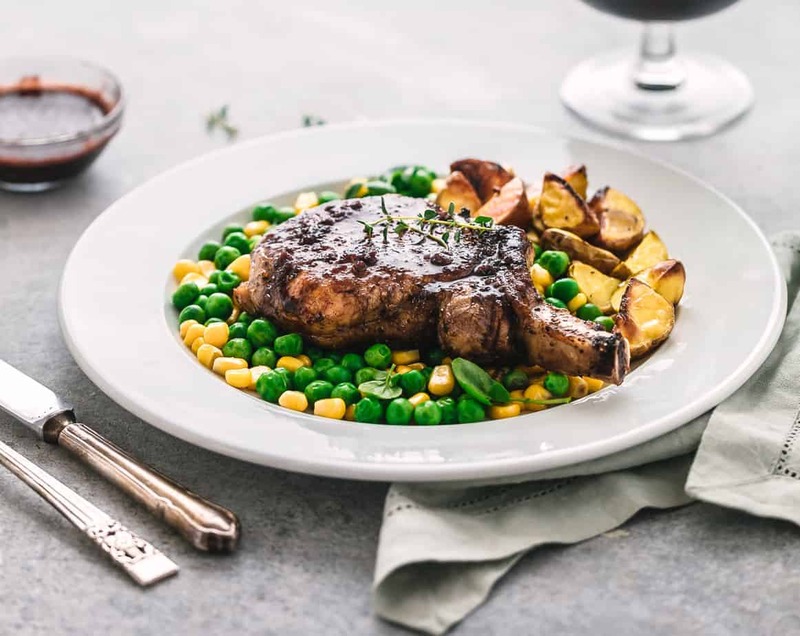 These pan-seared Pork Chops with Red Wine Pomegranate Glaze are quick and flavorful. It’s a meat dish that’s both sweet and sour, and can be ready in less than 30 minutes. It tastes great with just about any vegetables as a side. The pork meat is so tender and juicy, no marinating process is required. It’s the perfect meat dish that’s versatile enough for a weeknight supper or a hosted holiday with guests. 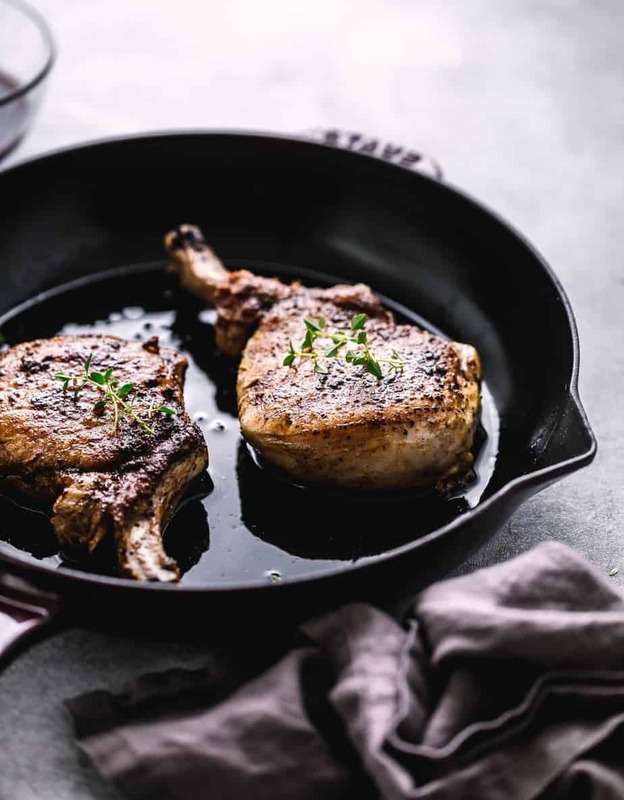 A large cast iron skillet is recommended to cook this Pork Chops with Red Wine Pomegranate Glaze on the stove, You can place 2 pork chops at the same time but be sure they don’t touch each other. Always cook each side slowly on a low heat. Cooking time will depend on thickness of chops, on average it will take about 4-5 minutes on each side. 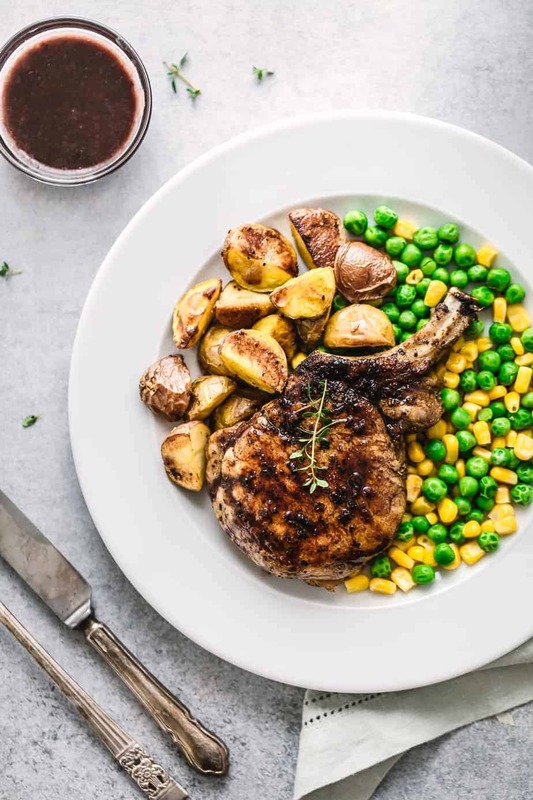 Keep in mind that whether you’re cooking boneless or bone-in pork chops and with any cooking methods (grilling, roasting, pan-frying, sautéing, broiling), the Internal temperature must reach 145F. I seasoned the pork chops with generous amount of salt, pepper and thyme, and cooked them in canola oil with 1 tablespoon butter. Then I seared the pork chops in a skillet over medium-low heat for about 4 minutes on each side over low-medium heat (until a nice brown and pink color on the inside (again make sure of the 145F temp). To make the delicious sweet and sour red wine pomegranate glaze I used a dry red bottle of pinot noir wine that I purchased from Grocery Outlet. You may also use other reds like Merlot, Côtes du Rhône Cabernet or Chianti for this recipe. If you have Grocery Outlet nearby, be sure to visit them this week to take advantage of their Extra 20% off all wine sale. The prices at Grocery Outlet are as you’d expect, fantastic. If you haven’t been there before I think what will shock you is the quality of their selection, especially wines! 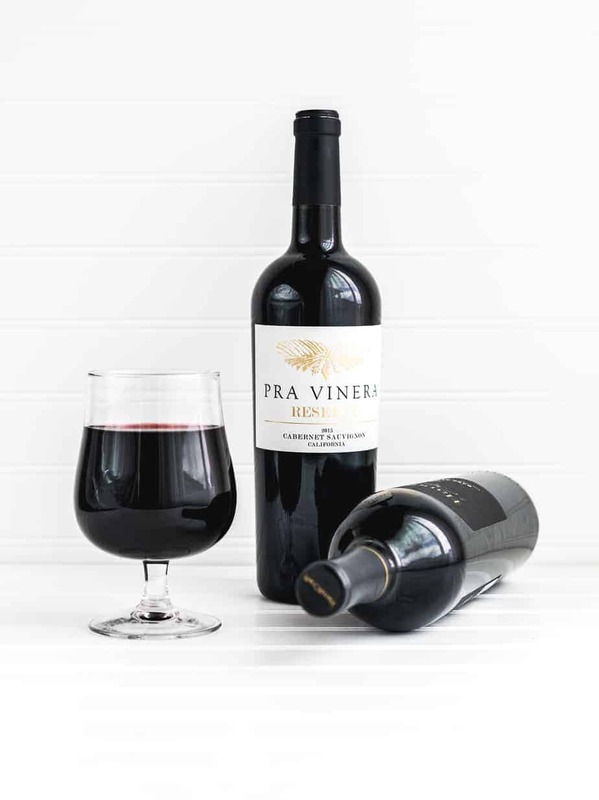 Grocery Outlet’s wine buyers know their stuff as they are industry experts that actually live in Napa where they buy the best wines at the biggest discounts. With the sale going on I bought 4 bottles to try for this weekend, Diama Extra Dry Prosecco (750 ml), Handcraft Dark Red (750 ml), Pra Vinera Pinot Noir (750 ml), and Indigo Eyes Sparkling Brut (750 ml). How’s that for a tasty weekend! I also picked up a wine for cooking my pork chop recipe, great to have another on-hand for the kitchen. Grocery Outlet has other quality products with great deals on my favorite organic snacks, fresh produce, quality cheeses and even personal hygiene products. One other differentiator for Grocery Outlet is the service. Both employees that were helping me went above and beyond what I expected or what I’ve experienced in most stores. I’m a newer Grocery Outlet customer, and I’m kicking myself for not having discovered it long ago. Season the pork chops with black pepper and salt. Heat canola oil/vegetable oil in a cast iron skillet over medium-high heat until smoking. Place the seasoned pork chops in skillet and cook for about 1 minute before turning. Add butter and thyme to skillet. Continue cooking and basting for about 1 minute before turning. Repeat this process every 1 minute until pork chops are golden brown and well crusted. (Total sear time about 4-5 minutes on each side). Remove the pork chops from the heat and let to stand for at least 3 minutes at room temperature before serving. Serve with red wine pomegranate glaze. In a medium sauce pan, add the pomegranate juice, dry red wine, chicken broth, garlic, thyme, honey and balsamic vinegar. Cook until the liquid is reduced by half. Turn the heat to low and add the butter. Keep stirring until it melts, then season with salt/pepper to taste. Oh wow! Such a flavorful dish and I love how easy it comes together. So perfect for an elegant weeknight meal. Agree! 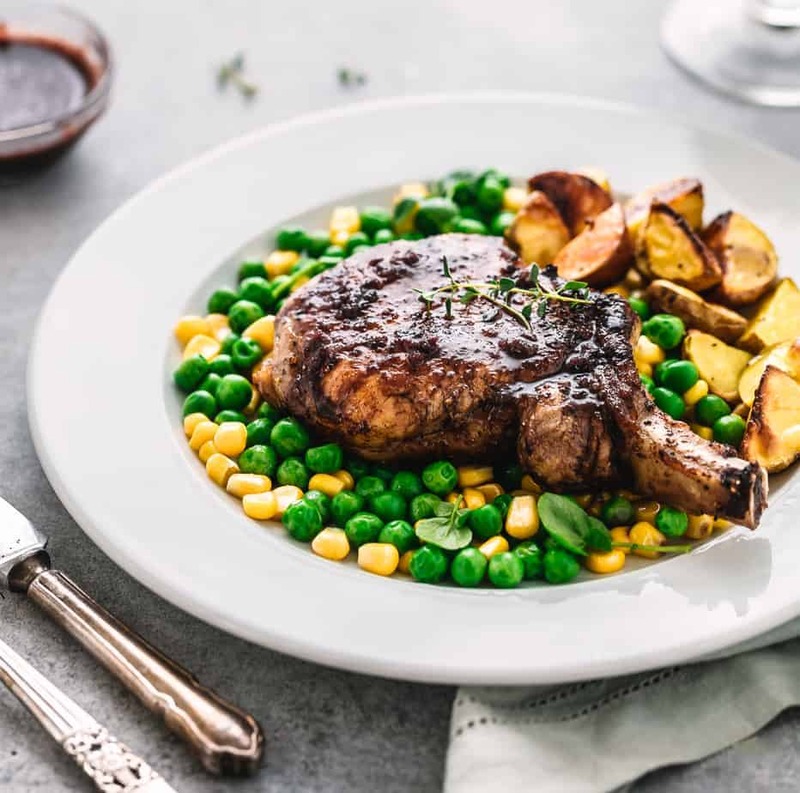 The red wine pomegranate glaze sauce is also perfect for lamb chops. Oh yum, this looks so fancy, and delicious! Sounds perfect to make for a date-night-in! Wow – those pork chops look so delicious! Love all the flavors and such a beautiful dish! I am thinking dinner this week very soon! It looks so good! Woman the sear on those pork chops has me faint with desire. I am loving anything with Pomegranate lately. These pork chops look perfect! I am obsessed with pomegranate too. Great on salad too!